Many of the plants I've sampled from the wild have analogues in the produce isle. Of course, there are a couple of plant families that dominate here, but I won't stretch that far and try to compare sunflower seeds to dandelion greens, even though they are members of the same family. Carrots have a wild version. We know the plant as queen anne's lace. Tall flat white lace-like flowers. Don't believe me? Dig a root and give a smell. Carrot for sure, but a bit spicier smelling. Do yourself a favor though and don't eat the ones that are flowering. You won't like the dry, woody results. Instead, try to find some of the first year plants near these that haven't flowered yet. Queen anne's lace is a biennial, producing the flower in its second year. Sweet potatoes, which are sometimes mistakenly called yams, are actually not related to potatoes. Real potatoes are members of the nightshade family, along with tomatoes, peppers, and eggplant. Sweet potatoes are related to the morning glory vine. There are wild versions of sweet potatoes, but I have yet to find them here. Instead, work your way to the nearest wetland (p. c. speak for swamp) and look for arrowheads. These water-loving plants produce tubers along their roots that cook up much like potatoes. 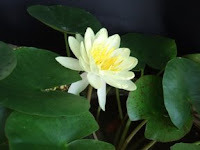 Also water lilies produce the same down along the roots at the bottom of your favorite pond. Most of these wild potatoes are best before the plant blooms, or late in the fall long after the flowers have gone. For you spinach lovers, there are several wild alternatives, but lambs quarters by far is the easiest to find. Once you see it here in the photo I am sure you are trying to remember all of the places you have seen it before. The youngest leaves are the best. Cooks just like spinach, which means it shrinks up a bit, so pick a lot. One of my favorite ornamental trees, is also a source of a great substitute for snow peas. 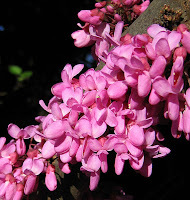 The redbud tree, as some of you may know, produces a pod that looks much like a pea pod, or small locust pod. If you pick these while they're young, they are great used like snow peas anywhere you would use the commercial variety. The flowers by the way, are also edible and although not very interesting in the flavor department, they look great on top of a salad. Salsify, is one of those items in the produce market that you may not have tried yet. Commonly called oyster plant, it has an oyster-like flavor when cooked. The plant produces a carrot-like taproot which is what you see in the market. Salsify's other name is purple goatsbeard. 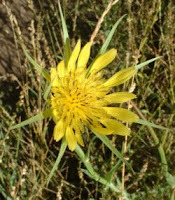 There is a local wild relative of this in our area called yellow goatsbeard. Looking much like a tall and larger version of a dandelion, it has the same uses as the purple variety. As always, be smart and know your plants, and keep away from polluted areas when foraging for goodies. Now why can't we have a northeastern wild coconut? Captain.... There be lambs here! !